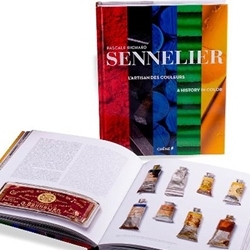 In celebration of Sennelier's 125th Anniversary, Chêne has issued a limited edition publication of the new book, Sennelier, A History In Color. Interweaving memories of the Sennelier family, testimonials from the likes of Pierre Bragilo and Karl Lagerfeld, and previously untold anecdotes about Pierre Bonnard and David Hockney, this extraordinary art book relates the story of the famous Parisian color maker on the Quai Voltaire. From Degas to Kenzo, from the impressionists to the art world of 21st century New York, this book takes a fascinating journey into the world of color.